Ladies and gentlemen, let's get started. The meeting is called to order. We anticipate we will be interrupted at some time in the not too distant future. The Chair: My notes tell me that we left off at clause 108. There were two amendments, NDP-64 and PV-24. I stand to be corrected by the clerk, but I believe amendment NDP-64 has been dealt with; it's out of order. Therefore, we have amendment PV-24, and this one is also out of order. That would mean we have only clause 108. That brings us up to amendment NDP-65, which is not in order. Amendment PV-25 is gone too. That means we have LIB-44 up, and I'm looking at Ms. Damoff. Mr. Chair, this was actually dealt with at LIB-42, I believe, so I'll withdraw it. NDP-66 is out of order and PV-26 is out of order, so we're on clause 109, on amendment CPC-23. Come on, Mr. Motz, we were making tremendous progress here with matters that had either been withdrawn, dealt with, or were out of order. You're slowing us right down. I apologize for that, Mr. Chair. You know my willingness to be co-operative as much as possible. 40.2 (1) Within the first four months after the commencement of each fiscal year, the Service shall submit to the Minister a report on the administrative costs of meeting the requirements imposed on the Service under the National Security and Intelligence Review Agency Act and the National Security and Intelligence Committee of Parliamentarians Act for the preceding fiscal year. It's similar to an amendment that we proposed, I believe it was as recent as yesterday, Mr. Chair. The reason this amendment is brought forward is to address the issues raised by some national security experts. They raised the concern that the administrative costs for NSIRA and the parliamentary committee, and this whole business, might have a negative impact on the actual costs, or the money spent on national security as opposed to the administrative costs with regard to this. That's all we're asking for. At a time when the world is more aware and has a heightened sensitivity to the risks that are present, we think that money allocated to national security should be spent there, and that we have a costing of the actual administrative costs. On debate, we have Ms. Damoff. Chair, the annual report required by this amendment would represent a new administrative burden for CSIS. During estimates, parliamentarians are free to ask questions regarding the impact of national security review, so we're not going to support this amendment. I just want to reiterate the point I made on this amendment, or on a similar one in the previous meeting, that I believe this could go a multitude of ways. There could be a burden on the agencies as well from the lack of response time from the agencies. At the end of the day, I think it creates a problem in terms of trying to undermine the credibility of these agencies as they're getting up and going. There's no such thing, in my opinion, as an administrative cost to accountability and review and oversight mechanisms. You might remember the testimony of Dr. Leuprecht, Mr. Boisvert, as well as Mr. Fadden, and based on other conversations our office has had, with CSIS providing to Parliament and the minister an accounting of that administrative cost, Canadians will have a better idea of actually how much the government has cut from national security and could be spending on administrative costs. In terms of compliance with the requirements within this particular piece of legislation, we don't know what the costs will be. It's never been factored in. I think it's responsible to know exactly what those administrative costs might be, moving forward. We'd like a recorded vote. That leaves no further amendments for clause 109. May I group clauses 109, 110, and 111 for one vote? Mr. Chair, I often find that I do not have the time to react. I have to wait until the interpretation has been provided. In a lot of cases, you start speaking again before I have had the time to jump in. Can you wait two or three seconds so that I can react? I am not listening to you in English. I am listening to the French interpretation. So what is the situation with the vote? Can I group the votes and do three votes at one time? The Chair: Do you want a recorded vote? We have to vote, I'm sorry. Members, I do need unanimous consent to carry on while the lights are flashing. I would have hoped that we could have gotten in at least a few minutes, because the vote is just down the hall. In the event that certain members, I know, have anxiety to sit around and wait for half an hour for the vote, I'm just wondering whether there might be some consensus to carry on for the next 10 or 15 minutes until we actually have to go down and vote. Are we good with that? Ladies and gentlemen, we're back on. The Chair: We have Mr. Dubé on NDP-67. This is an amendment that seeks to change the definition of “activities that undermine the security of Canada” to “threats to the security of Canada”. This is a recommendation that came from the B.C. Civil Liberties Association, among others, and from Professor Roach as well. It's obviously something that's been at the core of this debate for a long time, and with regard to former Bill C-51 as well. We believe this definition still gives the service the ability to do its work but will do more to protect rights and certain types of activities such as protests and things like that. There are a few consequential amendments to that as well. Before I call on Ms. May, because she will be affected by any changes to NDP-67, colleagues should note that in the event that we vote on NDP-67, it will affect NDP-68, NDP-69, NDP-70, NDP-71, NDP-73, NDP-75, and NDP-76, so up or down they're affected. Similarly, if NDP-67 is defeated or adopted, it effectively defeats PV-27, PV-28, PV-30, PV-33, and PV-35, all of which cannot be moved because they're identical. I'm going to call on Ms. May to speak to her amendments and then we will have debate. As you've accurately predicted, my amendments touch every single place where the quite novel definition of “activities that undermine the security of” is replaced with the definition more consistent to other acts within the Government of Canada: “threats to the security of”. This distinguishes this approach from a similar approach to protest taken in the CSIS Act which is indexed not to the overbroad and relatively novel concept of “activities that undermine the security of Canada”, but the more limited and traditional definition of “threats to the security of Canada”, [as] in [section] 2 of the CSIS Act. I would put to my friends the Liberals in this committee, as well as my friends the Conservatives and New Democrats—obviously Monsieur Dubé and I agree on this—that there's no policy rationale that's been put forward and there's no explanation for having this quasi-sedition section, with language that is so overbroad that it can't be found anywhere else in legislation that accomplishes the same purpose, in security legislation or anti-terrorism legislation. I hope my amendments will meet with success here, Mr. Chair. Thank you. Colleagues understand the arguments put forward by Ms. May and Mr. Dubé. Are there any comments? The concern I have—and it is a policy concern—is that “threats to the security of Canada” is a term that is used extensively in the CSIS Act for a purpose that is specific to CSIS's mandate. It would be problematic, therefore, to employ the same term for two distinct purposes in Canadian law and could lead to interpretive issues with the term in the context of the CSIS Act in the future, something that should obviously be avoided. Before I ask the officials to comment with their view, because I hope they would have something to offer on this—and I think they probably do, especially since we're talking about interpretive issues—this same concern that I've expressed applies to Green Party-27, NDP-68, Green Party-28, NDP-75, and Green Party-34. Mr. Davies, do you want to weigh in on this? Sure. Just to echo that comment, the “threats to the security of Canada” are already defined in the CSIS Act, as was said. It's very clear in the CSIS Act. The Security of Canada Information Sharing Act is not just about CSIS. It's about the entire national security community as already scheduled in the act and includes 16 other departments and agencies, including defence, border control, law enforcement, and so on. The issue with the SCISA definition in the concept of undermining threats to security is both that you would not want confusion with the CSIS Act and that it also needs to be broad enough to include the entire national security community. Is there anything further? I think Ms. May was first and Mr. Dubé was second. I appreciate the view of the officials, but with all due respect to Mr. Fragiskatos, Professor Roach and the Canadian Bar Association aren't pikers, and this isn't, as we like to say, their first rodeo. Professor Roach is one of the country's leading experts in security law, and the same departments and the same Justice officials in the previous government gave us completely dangerous broad definitions such as “terrorism...in general” in part 3 of Bill C-51, which made no sense, but they defended them just as vigorously to a committee then. With all due respect to our officials here, there is no justification for having a different definition. It doesn't add confusion to the law to be consistent. It adds confusion to the law to use a novel definition that's found only in the Security of Canada Information Sharing Act. I agree with Ms. May entirely and I would simply add that it's even more dangerous, to my mind, in this context, because information sharing is at the heart of one of the most problematic elements of former Bill C-51, now being modified through Bill C-59. I think the wording that both Ms. May and I are proposing here is far more appropriate and, as she so eloquently pointed out, is what is proposed by many experts who clearly have expertise in the field. The Chair: I read into the record the consequential results of defeating amendment NDP-67 on both PV amendments and the other NDP amendments. Therefore, amendment PV-27 has been dealt with. We're now on clause 113, and I'm going to ask the clerk what we did with amendment NDP-9.6. I'm advised that amendment NDP 9.6 is inadmissible. Amendment NDP-68 was dealt with in a previous vote, as was amendment PV-28. Now we're going to clause 114 and amendment NDP-9.7. I'm advised that amendment NDP-9.7 is inadmissible. Chair, do I get to speak to the inadmissible amendment? If you wish. We didn't actually vote, so going back to amendment NDP-9.7, you can speak to it. This will be brief. This is another consequential amendment to what I presented in the first meeting that seeks to fully repeal what was SCISA, now SCIDA, the information sharing regime brought in by former Bill C-51. Okay, shall clause 114 carry? On clause 115, we have amendment NDP-9.8. Do you wish to move that? Chair, there are several amendments, NDP-9.8 and so forth, which I believe, since they seek to repeal the SCIDA, will be ruled inadmissible. However, it was important for me to move these amendments to make the point that this is probably the most unchanged element of former Bill C-51. These are cosmetic changes at best. I won't speak to and move all of them, but I want that on the record as the reason for presenting these amendments today. That is a key point for New Democrats with regard to Bill C-59. As you know, it's going to be ruled as inadmissible. On amendment PV-29, we have Ms. May. Mr. Chair, I thought that was defeated with amendment PV-27. It's again to replace “undermine the security” to the test of “threats” to the security of Canada. I'm perfectly happy to put forward an argument in favour of it. It wasn't dealt with by a global motion, so it's still alive. That's wonderful. Let me then put it forward. I thought it was caught under the same argument. At page 114, it would amend the clause so that the language would be replaced with the more traditional definition of threats to the security of Canada in order to strengthen the act. The Chair: We've already dealt with amendment NDP-69. Mr. Chair, LIB-45 is withdrawn. We are then on to amendment CPC-24. As this was already in Bill C-51, we intended to withdraw this amendment from Bill C-59. However, there may be some confusion about it. Could the officials tell us what the situation is? Does anyone want to comment on the request of Mr. Paul-Hus? I will just explain what it does. It takes away from the definition pure activities of “advocacy, protest, dissent and artistic expression”. It's to make clear that we don't wish to capture those when sharing information. However, we did modify it to say that if such an activity were conducted in conjunction with an activity that is captured in the definition, we can then share information about that particular activity. We think that reaches the right balance in respecting advocacy, protest, dissent, and artistic expression, but also not being prevented from sharing information when we need to, when there is an actual threat to national security. The Chair: We are on amendment NDP-9.9. Do you want to move it? NDP-70 has already been dealt with, as has PV-30. The Chair: Is NDP-9.10 so moved? NDP-71 has already been dealt with. I think PV-31 is still alive. Again, Mr. Chair, this is to restore the language that is more traditionally used as to threats to the security of Canada as opposed to undermining the security of Canada. I would hope that in this instance, perhaps, we could restore the CSIS definition. The Chair: Next is NDP-9.11. We now have amendment CPC-25. It changes the word “may” to “must” with regard to the Government of Canada institution's own initiative. This is based on testimony from the former head of CSIS and other knowledgeable security personnel who noted that information sharing is critical to having Canada deal with national security threats. Siloed information is a major risk. We've heard that repeatedly throughout the testimony. It should never happen, and we should never read that Canada was attacked or failed to act because someone didn't share information or take the time to call another agency. I proposed the amendment to require public servants who obtain information to share it with the relevant national security and intelligence teams. While the act provides for “may” share, the number of times privacy and charter rights are mentioned will cause them to withhold out of self-preservation. Where there are questions of privacy, public servants can consult the commissioner for rules without disclosing the information. It can share with NSIRA to make sure the information is handled appropriately. This bill is supposed to be about protecting Canadians, and we should have everyone on the same page with respect to sharing information. I don't want to speak presumptuously, but I think it's something that my colleagues across the way have said repeatedly. The siloing of information is a risk. That's the purpose of this amendment, Mr. Chair. The Chair: We'll now go to amendment NDP-72. This amendment is intended to change the current wording about sharing information. So our proposal is to replace “the disclosure will contribute to the exercise” with “the disclosure is necessary to the exercise”. ...the breadth of security information disclosure and sharing under Bill C-59 remains almost as large as it is in Bill C-51. This will provide challenges both for the Privacy Commissioner and the new review agency asked to keep an eye on this system. As the Privacy Commissioner suggested, the use of the word “necessary” limits the sharing of information to the form that is the most essential for the exercise of the functions that the various organizations have. Before we go to debate, I'll point out that, if NDP-72 is adopted, PV-32 cannot be moved, as they amend the same lines. Mr. Chair, I do believe that the evidence from many witnesses, as Mr. Dubé said, was that the disclosure requirements with the low threshold of “will contribute to the exercise of the recipient institution's jurisdiction” is far too low a threshold. For this kind of provision, the information sharing should be required to be necessary for the exercise of the recipient institution's jurisdiction. The testimony is very clear on this point, and this was one of the worst sections—although it's hard to pick the worst section of Bill C-51, but this is one of the least improved in C-59. I would hope that this amendment would meet with approval at this point. The amendment proposed by Mr. Dubé and Ms. May is one that actually goes too far. We have one coming up that would add a necessity threshold, LIB-46, which we feel is better suited to what is needed for the legislation. The Chair: Because NDP-72 was not adopted, PV-32 is still in play. Is there anything you wish to add, Ms. May? No, I've spoken to this amendment. NDP-73 and PV-33 have been dealt with. We are therefore on to LIB-46. Thank you, Chair. We're flying through these. We heard testimony from, as just one example, the Canadian Muslim Lawyers Association about the need for a necessity component being helpful. This amendment establishes a necessity threshold to retain personal information disclosed under SCISA and imposes a destruction obligation for personal information that does meet the necessity threshold. If LIB-46 is adopted, so also is LIB-50. This is not an adequate amendment, compared to the amendments that Ms. May and I proposed, for a variety of reasons. I may speak for Ms. May, and I will say that we both attempted to change that definition, so for both those reasons, I believe this amendment is inadequate to achieve the objectives that witnesses asked us to achieve. I agree with this, but I'm wondering whether there should be a retention period. Is that something that is—even if it's for a short period—plausible here or not? You're directing that question to...? I'm directing it to the officials, please. Yes, as soon as the information is found not to be necessary for the jurisdiction and responsibilities of the recipient, they must destroy it. That is what preserves the privacy interest of the individual whose information is presumably being shared. However, if the information is found to be necessary, that's when they may retain it and the information is then subject to normal retention periods in individual institutions. Is there any further debate? I see none. If LIB-46 passes, so therefore does LIB-50. The Chair: We're now on LIB-47. LIB-47 is withdrawn, unless Mr. Dubé wants to do something different. It has the same problems as the previous one, so no. This amendment removes reference to “retention and disposal” from the clarification. The new requirement to “destroy or return” proposed under amendment LIB-46 affects the retention and/or disposal of personal information shared under SCISA; therefore, reference to “retention and disposal” must be removed from the clarification. Could the officials provide us with some explanations about this? There are points that we find difficult to understand from a technical point of view. There was once a provision in the bill—and it is still there for the moment—that indicated that nothing in the legislation affected the retention or disposal of information. An amendment to that effect has just been passed. That is why these words must be taken out of the bill. If they are not, there will be a contradiction. We now move on to LIB-49, which was Ms. Dabrusin but is now Mr. Fragiskatos. This amendment would add a new section to clarify the relationship between SCISA and the Privacy Act, specifically that SCISA is an authority to disclose personal information as per paragraph 8(2)(b) of the Privacy Act. This amendment would specify, to be clearer here, for greater certainty, that SCISA is an authority to disclose personal information as contemplated by paragraph 8(2)(b) of the Privacy Act. The Chair: Mr. Dubé, do you wish to move NDP-9.12? Yes. I will propose the amendment, once again with the objective of rescinding the points about sharing information. I'm to rule that as inadmissible. LIB-50 has already passed. We're now on to NDP-74. The objective of this amendment is to allow the Privacy Commissioner to obtain the documents prepared as part of the information-sharing system. This was requested by the commissioner, as well as by the Canadian Civil Liberties Association and the British Columbia Civil Liberties Association. Mr. Chair, the NSIRA has been designated to review national security activities across the Government of Canada, including reviewing the full scope of information-sharing activities for national security purposes. The bill obligates institutions to provide copies of records to NSIRA for this express purpose. Furthermore, under the Privacy Act, the Privacy Commissioner already has the authority to review personal information-sharing practices of government institutions and to request records of such practices. To provide an additional explicit authority to review these practices in SCISA is, I fear, redundant. The Chair: We're now on to clause 120. Do you wish to move NDP-9.13, Mr. Dubé? It is ruled as inadmissible. We're now on to LIB-51 with Mr. Fragiskatos. This amendment is consequential to LIB-50. It accommodates the new record-keeping requirement for recipient institutions that was introduced by LIB-50 within the record-keeping regulation-making authority. The Chair: NDP-75 has been dealt with. We will go to Ms. May on PV-34. This again pursues consistency in my efforts to remove the new language “undermine the security of Canada”, and revert to a more traditional, understood, legislatively predictable, and less murky threshold with “threats to the security of”. It would be wonderful to see it change in one place in the act, even as we go along. PV-36 is still good to go. This moves to a completely different area. This is to repeal the changes that were brought in by the previous government in Bill C-51, which removed protections for named persons in security certificate proceedings. This was adopted following a 2007 ruling by the Supreme Court of Canada in Charkaoui v. Canada. The framework in place at the time allowed for non-disclosure of evidence in certificate hearings, and the court found that this did not impair the rights of people named in certificates. The legislative move by Bill C-51 was to reduce those protections for named persons in security certificate hearings. You'll recall that there was evidence for this from Alex Neve of Amnesty International and from Professor Kent Roach of the Canadian Civil Liberties Association. The effect of my amendment—and I'm certainly not going to read it because it is quite long and extends over several sections—is to repeal the entirety of the changes made to the Immigration and Refugee Protection Act in Bill C-51 of the previous Parliament, and to restore important protections to people who are affected by security certification proceedings. As Ms. May has mentioned, this amendment would remove changes that were made to the Immigration and Refugee Protection Act or IRPA in 2015. The changes were made to help the government protect classified information that is used in security certificate proceedings before the Federal Court. The changes were crafted in response to a Supreme Court decision, Canada v. Harkat, in 2014 to ensure their charter compliance. If the amendment goes forward, the government would lose the ability to immediately appeal or seek judicial review of an order requiring public disclosure for information that the minister believes should not be disclosed. In those circumstances, the government may be forced to withdraw this information to protect sensitive national security interests, and that would weaken the case before the Federal Court. In my submission, this amendment should not be pursued. The preservation of Canada's national security interests is of critical importance. At the same time, the Charter's guarantee of a fair hearing and due process before an independent and impartial tribunal is a non-negotiable condition of a free and democratic society. The delicate balance struck by the courts to protect those rights prior to the Anti-terrorism Act of 2015 should be restored. So the advice of the Supreme Court of Canada is in favour of my amendments, which I'm putting forward right now. Where are we with NDP-77? It's good to go. We'll have Mr. Dubé, please. I want to take this opportunity to thank advocates like, obviously, No Fly List Kids, who are parents of children who have found themselves on this list among others who have fought against this very broken system that is colloquially referred to as the no-fly list. This amendment seeks to change the wording from “reasonable grounds to suspect” to “reasonable grounds to believe”, believing that the word “suspect” is a very low threshold, it has created a “better safe than sorry” mentality when it comes to listing folks, and obviously there are also the risks of profiling that exist with a list such as this. By having reasonable grounds to believe, we believe we're creating a threshold that requires actual evidence to be in hand before a decision is made to put someone on this list. Lastly, Chair, this was recommended by the BCCLA, as well as the CCLA. I'm not a lawyer. Could the officials weigh in on the difference between reasonable grounds to suspect and reasonable grounds to believe. I've met with the No Fly List Kids as well, and I want to make sure we get this right while also ensuring we have the names that should be on the list. Could you clarify that for us? I'm assuming that's Mr. Slatkoff. Welcome to the committee, sir. Can you respond to Ms. Damoff's inquiry? The reasonable grounds to suspect threshold is a lower threshold. It requires a lower degree of certainty than reasonable grounds to believe. However, it still must be supported by factual elements that can be proven in evidence. The Supreme Court has said that a hunch or intuition gained by experience would not suffice to meet this threshold. It can't be speculative. It has to be grounded in fact. It is a commonly used threshold in various other pieces of legislation such as the CSIS Act and the Criminal Code. To add to that, to get on the list is reasonable grounds to suspect, but that's not the same threshold for denying travel. There's a two-part test. The decision must be considered specific, reasonable, and necessary to prevent an individual from threatening transportation security or travelling for purposes of terrorism. I think the results that real people on this list have faced speak for themselves. Is there any further debate on amendment NDP-77? The Chair: Amendment NDP-78 is still in play. This amendment follows recommendations by the International Civil Liberties Monitoring Group as well as the B.C. Civil Liberties Association, which require, as does amendment NDP-84, that the minister provide individuals with written notice immediately once they have been confirmed to be on the list, rather than having them find out when they are arriving to travel. This is something that would allow any kind of appeal process to take place at a more opportune moment and not wait until the person is unable to travel, especially if they are on the list mistakenly. In this way they can begin to undertake the process immediately. Before we ask for debate, as Mr. Dubé raised in his argument, amendment NDP-84 will go up or down as amendment NDP-78 goes up or down. For security reasons, the government doesn't notify people when they're put on a list, but from a more practical standpoint, if your name is William Fraser, even if the government did notify a particular person, there still could be 25 other William Frasers in Canada who wouldn't know until they got to the airport. I understand the intent, but one of the issues now is that it's a name, not a person. Even notifying a person would not solve the issue of people showing up and finding out that their name is on a list. I think the argument I'm hearing implies that the only people who are not deserving of being on the list are false positives. There are plenty of people who are actually being put on the list and who deserve to go through the appeal process and who perhaps aren't meant to be on that list. I think it's important to bear in mind that the assumption that we're not notifying those who are victims of false positives, while certainly an issue, I agree with my colleague, is separate from the issue we're trying to address here. It's worth mentioning that with regard to no-fly lists, essentially you have Canada and the United States operating in this way. I also think, given the information sharing that we see, with low thresholds for being put on the list, with that type of mechanism, we're not talking about the kind of high-level situation that wouldn't allow someone to engage in an appeal process, which, by the way, is also quite broken, much in the same way the list is. My question is to my colleague from the NDP. What if there's an example of someone who should have been listed and didn't reasonably know that they were already a security threat to Canadians? I don't know if that would exist. We've heard from innocent Canadians impacted by this issue, but we haven't heard any testimony from terrorists or from those who are a threat complaining about being on the no-fly list. Why are we seeking to help out those who are a threat to our country with this? The equivalent for me, with my background, is that if a police agency knows someone is suspicious, the person who is suspicious already knows they're suspicious, if that makes any sense. This seems to be an extreme amendment for something that we really don't need. I'm having trouble understanding it. Mr. Dubé, do you wish to respond? I see no further wish to debate. The Chair: Amendment NDP-78 is defeated; therefore, so is amendment NDP-84. That brings us to clauses 129, 130, 131, 132, and 133. May I group those five? The Chair: We are on amendment NDP-79. If the Minister does not make a decision in respect of the application within a period of 120 days after the day on which the application is received—or within a further period of 120 days, if the Minister does not have sufficient information to make a decision and he or she notifies the applicant of the extension within the first 120-day period— the Minister is deemed to have decided to remove the applicant’s name from the list. We are talking about people contesting the fact of finding their names on the list. Clearly, given the objective of the list, 120 days is extremely long for people who certainly have travel plans. So our objective is to reduce the period to 30 days. If the information obtained is enough for a person's name to be put on the list, I do not see why the minister could not deal with cases of that kind in 30 days. It's a reasonable deadline. Before I ask for debate, PV-37 is affected by the vote on NDP-79, so Ms. May, do you wish to speak to it? If this amendment carries, then it would affect mine, but if it doesn't carry, it doesn't affect mine. Is that correct? That's true. If it's adopted, PV-37 can't be moved. If you'd like me to speak to PV-37 now I will, which is to say that my amendment affects the period of days that are currently referenced in clause 134 in proposed Bill C-59 as 120 days. My amendment would return it to 90 days. I think Mr. Dubé's is better, but I went with a compromise. I think 120 days, as is proposed in Bill C-59, does in fact give a reasonable time frame to work with here as far as recourse is concerned. What does that recourse process look like? It includes producing an unclassified summary to be provided to the individual, an opportunity for the individual to fully consider this information and respond, time for the minister to carefully consider all information produced by security agencies and provided by the individual before making a decision, for which 30 days is not enough, nor is 90 days enough for that. That's why I can't support Mr. Dubé's nor Ms. May's amendment. For a party that made great hay during the hearings on this bill of supporting people who are wrongly affected by this list, it is important to note, for the record, that the bill actually increases the number of days that the minister has before notifying someone. Let's be clear here. The way the bill is drafted, even without Bill C-59, if individuals are not receiving a response in an adequate period of time, their names are removed, so essentially what the changes in Bill C-59 do is allow another month, another 30 days for individuals to wait in limbo while they potentially may want to travel. There aren't a million people on this list. There are obviously thousands who are affected as we've seen in the last number of years, but it's safe to say that if the information is truly accurate, there is no reason why the minister can't address this type of injustice in 90 days. I am calling for 30 days. I appreciate Ms. May's notion of a compromise, which is actually returning to what is currently in legislation prior to Bill C-59. It is pretty important to note that we're increasing the amount of time the minister has, while individuals are stuck in travel limbo. l wish to remind you of the testimony of Kent Roach. He said that four months is a long time to be a wrongfully listed person. The Chair: NDP-79 is defeated; therefore, PV-37 is still in play. Ms. May, do you wish to have further debate on PV-37? That would be appropriate at this point. Think about the no-fly kids groups you heard from. Think about why the Liberals want to add more time to Stephen Harper's 90 days and go to 120 days. Just think about it, and please vote for my amendment. We are clause 135 and NDP-80. This contrasts with the current wording, that the judge “may” remove the name from the list. It's my belief, and I'm sure many others, that if a judge is deeming that the person is on the list in an unreasonable fashion, there is no reason why they must not order the immediate removal of that person's name. I'd ask the officials to weigh in on this, if they would. The current law allows judges' discretion in crafting a remedy. If they feel the initial decision to add somebody to the list was not supported, the judge, under the law as currently drafted, can still order that the person remain on the list based on new information that's presented before the court. This is different from a judicial review. That's why this section is called an appeal under a judicial review. If the initial decision is unreasonable, it has to be sent back to the original decision-maker. In this context, given that we're talking about national security threats and the need to maintain people on the list if there's current information that they pose a threat that would make a decision today reasonable, it's arguably appropriate to allow judges to have that discretion. The Chair: We are on NDP-81. One thing the no-fly list succeeded in doing was creating a consensus. I hope that in that consensus we can also all agree that this is a very broken system. In that spirit, I think it's important there be more accountability instead of some nebulous backdoor mechanism that exists. Acknowledging that there are national security concerns, we believe the minister should be tabling an annual public report that contains the number of names on the list, the number of requests for appeals, and the results of the appeals, to actually have a proper notion of how many injustices are being caused by this type of list, and how many people are being affected and able to successfully appeal that. Disclosing this information could cause an issue for national security. More importantly, there are other avenues for oversight for the no-fly list, one of which is the new committee of parliamentarians, as well as the Office of the Privacy Commissioner. I find it interesting that you bring up national security. Some people have the same name as others whose names are on the list. Those individuals complain in public about the fact that their names are on the list. We know the names, but we do not want to disclose the number of those names. In my opinion, this information has a very minor effect on national security. I'm just curious to know whether officials feel there's any risk to individual security or national security, or privacy and international security, from producing such a report. Certainly, in regard to revealing the number of people on the list, the Federal Court already agreed with the government that it would be injurious to national security. That was in a ruling in 2016. So it's a yes. 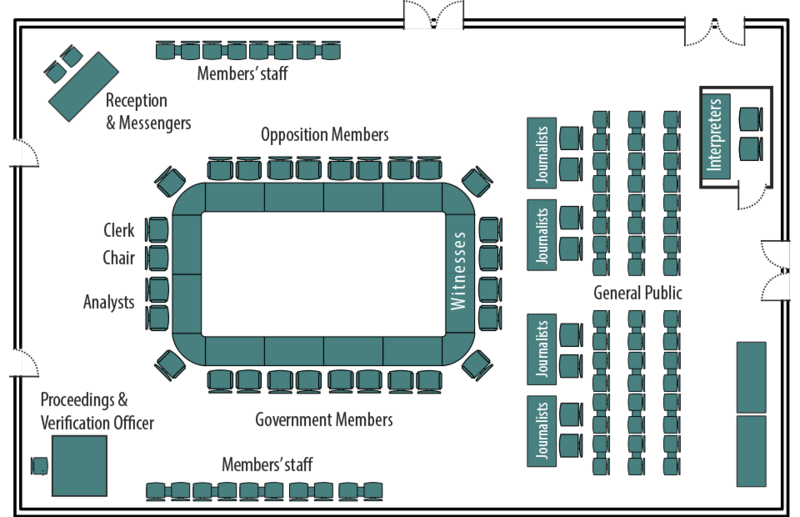 Then, as was mentioned earlier, we have this committee of parliamentarians. That would be the other avenue through which this information could become available. Is that what you're saying? Again, it would be classified information, or it could be redacted and released. NSIRA as well could look at this. In terms of the number of appeals, that would already be public. That would be public through the court system, so you would know that anyway. The Chair: We go to amendment PV-38. We're still within the sections that deal with the no-fly list and appeals against being on the no-fly list. I'll speak to both of my amendments at the same time, just to advance things for committee. They both speak to the same issue that was put forward by Kent Roach, by Alex Neve from Amnesty International, and by the Canadian Civil Liberties Association. The goal here is to appoint a special advocate so that during a no-fly list appeal hearing, where secret evidence is heard, there is an advocate for the public interest. Green Party amendment 38 sets out that there must be a special advocate. Green Party amendment 39 sets out the content of the responsibilities of the special advocate. Again, this doesn't make any information public. It just ensures that the public interest is well represented. The use of special advocates, as I mentioned in yesterday's review of other clauses, stems from the post-9/11 anti-terrorism legislation of the Chrétien government, that if you're going to have security certificates, there be somebody there in the room who represents the public interest, because these hearings are extraordinary. They're secret. The rights of the individuals whose lives are being affected can't be represented by them in the room, so the special advocate's role is terribly important for protecting civil liberties in this country. I hope you'll give full consideration to including both Green Party amendments 38 and 39, when the time comes. I know that Mr. Dubé will speak to one of these as well. To have a special advocate in that hearing room to represent the concerns of inappropriate use of information or inappropriate denial of rights is a safeguard—it does absolutely no harm—to ensure that we are consistent with what we do with security certificates, with what we do when we're impeding people's rights to travel into other countries. We have four amendments coming up that all deal with special advocates. I just wonder if officials could weigh in on the benefits or the disadvantages of having special advocates as part of this process. My colleague from the Department of Justice talked about special advocates in the context of the Canada Evidence Act. I think the other day we talked about special advocates in the context of CSIS and warrants, and here in this context. The answers are all pretty much the same. The judge always would have the discretion to appoint an amicus, a cleared amicus. In many cases, those amici are also special advocates. There are only so many lawyers, I guess, with a national security background and cleared at that level. So that discretion is already there. I guess the difference in this case, relative to division 9 of IRPA when you're talking about potential detention, rulings of inadmissibility, and deportation, is that here, in the SATA context, we're talking about the ability to get on a plane or not, to be honest, to make your flight. The rights invoked are very different. So before you would want to create perhaps a whole new regime at much higher cost, it would be something to consider in that decision. Just before I call on Mr. Dubé, for those of us who are cursed with a law school education, “amicus” means friend of the court. That's how you're using it in this context? To the officials, can you help me understand how a special advocate works? Just from a curiosity perspective, is the cost covered by the system, by the government, or is it covered by the individual who is having this appeal? The cost is covered. The Department of Justice has a special fund and a roster that names people as special advocates. Just in terms of the merits of the amendments themselves, I have the same amendment, so I would echo the points that Ms. May has already made. I just want to ask something. Ms. Damoff talked about Liberal amendments coming up related to the Secure Air Travel Act and special advocates, but I don't see those amendments. Just for the sake of understanding the back and forth of debate, I'm perhaps wondering what was being alluded to. You said there were amendments coming up dealing with special advocates. I thought your NDP-82 and NDP-83 also dealt with special advocates, do they not? I just wanted officials to comment on special advocates, that's all. I know we're not debating them right now. I understood the same way Mr. Dubé had understood, that there were, somehow or another, Liberal amendments coming up. It was the collective “we”, not the Liberal “we”. I would echo what Ms. May said, and I find it unfortunate that, for such a broken system, my sense then is that the belief is that we've gotten it right on the first try with C-59 on the government side. That's really too bad, because there are going to continue to be injustices caused by the system, but I'm pleased to support Ms. May's efforts, which mirror my own. Chair, I spoke to this already, because it was of the same part and parcel in terms of why we need a special advocate for these secret hearings on being on the no-fly list, so I'll leave it with my previous comments. I understood you did speak about PV-38 and PV-39, but I still have to move them. The Chair: On NDP-82, we have Mr. Dubé. NDP-82 is simply my attempt at the same effort that Ms. May made, which is to allow for special advocates as part of this process. I think the purpose has been presented eloquently, so I will content myself with that statement. Is there any debate on NDP-82? The Chair: We move to NDP-83. As in the case with Ms. May's amendments, this is a complementary amendment to NDP-82. It's so moved. The Chair: We now have PV-40. Again, going back to the fact that C-59 has not repaired the damage done by C-51 as it relates to access for special advocates to all information in the government's possession about particular cases, this amendment is put forward on the advice of Professor Kent Roach, Alex Neve, and the Canadian Civil Liberties Association. This one is to amend those sections such that the special advocates have full disclosure to all the information in the government's possession relating to security certificates. My concern is the lack of flexibility given to judges who might, if necessary, want to exempt the minister from fulfilling his obligations in all circumstances. I would like to retain some flexibility for the sitting judge that the amendment does not provide. So I will be voting against this amendment. Is there further debate on PV-40? We are now on NDP-85. NDP-85 is part of a suite of amendments that deals with an issue that has been quite controversial. If I may, I'll take some time to explain, given the fact that, with poor rhetoric and intentions from others in the political sphere, it can easily be presented with a different intent than the one it comes forward with. While we understand the need to always find ways to improve public safety and to tackle the issue of terrorism, I think the terrorist entities list has caused numerous problems, which have been raised by some of the foremost experts, most notably Professors Forcese and Roach in a paper they wrote called “Yesterday's Law: Terrorist Group Listing in Canada”. We've seen that there's a cost to taxpayers for this listing and the charter challenges that come along with it. One such case that we've actually seen in the news currently and is going to have significant costs is the one related to Mr. Abdelrazik, the Canadian who is a Sudanese refugee and was arrested when he returned to Sudan and was a victim of torture there. We've seen in the news lately some dubious behaviour on the part of CSIS with regard to the work being done by diplomats. Canada refused to issue a travel document to substitute for his now expired passport because he was still listed using this entity list. While recognizing that a variety of things need to be tackled, whether it's intelligence and evidence for prosecution or working on how we prosecute and charge terrorist charges, which aren't even always used when we're dealing with cases of terrorism because there's a challenging legal situation around that, the fact of the matter is that anything that's creating situations where we have Canadians being stuck abroad, where we have information sharing and dubious constitutionality, not only harms people's rights and freedoms, but it also causes, naturally, issues with public safety. We want the most accurate information, and we want to lay charges but to do it in a way that is the most efficient. This process is a secretive process. Appeals are limited. We're not talking about something that's happening in a court. In fact, some of the provisions that are also related to the use of assets are problematic as well. I would point, Chair, to the International Relief Fund for the Afflicted and Needy (Canada), IRFAN Canada, which hasn't had a chance to contest any of this in court because the same provisions have frozen its assets. I think we can acknowledge that there are many groups that have committed atrocities throughout the world, but I think what makes us stand apart from the very things we purport to combat is the fact that we have due process and the fact that we don't create lists through back doors that have challenges in terms of their constitutionality. It's something that's been raised numerous times, in particular by Professors Forcese and Roach, as I've said. Professor Roach, in fact, in his brief, recommended eliminating entirely this listing for the reasons that I have elaborated here. Again, I think due process should not be compromised because of lists that are drafted in the regulatory and political sphere. I think it's extremely problematic; cabinet essentially has unilateral control. For those reasons, I believe we should move forward on repealing these different elements. I would make one last point, Chair. I had the chance in the House of Commons to debate a private member's bill that sought to create a similar list related to organized crime and gangs. One of the points made at that time was the fact that the expediency that is sometimes sought by creating this list, which seeks to.... In that particular instance, the issue was that, with organized crime, the crown is constantly having to prove that organized crime is what it is. If criminal organization X is before the court, the prosecutors are constantly having to resubmit evidence, and it's a laborious process. However, a list with dubious constitutionality does not resolve that issue. The same concept applies here. Finding us in a situation that leads to more litigation is not one that ensures public safety, and it costs taxpayers an extraordinary amount of money. The final thing I'll say for the record is that I believe, and New Democrats believe, that if we can find any mechanism that keeps Canadians safe, we will always study it with rigour and give it the proper consideration it deserves. Any replacement for this mechanism that would be more appropriate and have the proper mechanisms in place is a proposal we would in good faith be willing to consider. As it stands now, this is a list that has failed, and I'm taking the opportunity in this debate on this legislation to move these amendments. I appreciate the committee's indulgence for that rather long intervention. As I said, if you just go out there and say you want to repeal a list of terrorist organizations, it can sound odd to the person listening in. I think it's important that Canadians understand the objective that I'm seeking to achieve here today. Before I call on Mr. Picard for debate, members should know that if NDP-85 is defeated, so also are NDP-86, NDP-89, NDP-90, NDP-91, NDP-92, NDP-93, NDP-101, NDP-102, NDP-103, NDP-104, NDP-105, and NDP-106. That deserves a longer answer. It's an important issue, and Mr. Dubé makes good points. This is a tricky and very important issue. I would like the fight against terrorism to be crystal clear; I would like the information that we have in the field to be easy to sort out, and everything to be black and white. Unfortunately, in reality, our agencies constantly have to be working with shades of grey. The bill does not contain make-do solutions. On the contrary, it is an instrument in response to a United Nations Security Council resolution. So this is no isolated initiative with no basis. It is also an important instrument that gives us the legal framework we need to seize the assets to which my colleague referred. I would like our expert witnesses to talk to us about the negative consequences that amending the proposed definition would cause. The definition relates to the listing process because it refers to “listed entity”. Canada is obliged under the UN Security Council Resolution 1373 to “freeze without delay” property belonging to terrorists or those associated with them. Canada has implemented this obligation, in part by creating a terrorist listing regime in the Criminal Code that allows Canada to list entities as terrorist entities, which results in the immediate freezing of their property. On the listing process and the listing entity, the Criminal Code's listing process also facilitates the application of other statutes, such as using the Charities Registration (Security Information) Act to deregister a charity or to refuse to register an organization as a charity. It also assists in the fight against terrorist financing. Other democratic countries have similar listing provisions. There are a number of safeguards associated with the listing process, such as, a rigorous process which includes an objective assessment of the activity of the group or individual to evaluate if the entity meets the threshold set by the Canadian legislation, the explicit criteria set out in section 83.05 of the Criminal Code, the automatic review that's required, an application on the part of a listed entity to the Minister of Public Safety to be delisted, a ministerial decision or deemed decision on that account that can be judiciously reviewed in the Federal Court, and that the entity may make another application when there are material changes in circumstances or after the automatic review has taken place of the listing. There are a number of safeguards attached to the listing process, and a number of reasons for it being in place. The goal of Bill C-59 is to have modern legislation that corresponds to the new realities and brings us closer to our allies. That is the reason we created the National Security and Intelligence Committee of Parliamentarians. We actually had to make up for some shortcomings in order to be at the same level as our allies. So I feel it is ill-advised to remove this kind of list and to take a step backwards in relation to our allies, with whom we want to collaborate in the fight against terrorism. I am therefore going to vote against this amendment. This is in response to the comments made by a gentleman from the justice department. My amendments don't remove our ability to freeze assets. It would require them to do so through the courts. I want to refer to that paper from Professors Forcese and Roach that I mentioned. First, I want to address the point of other democracies. I'm sure both professors would not appreciate selective quoting, but the format of our exercise doesn't easily allow for the type of elaborate thought we might want to pursue in this type of complicated matter. At this writing, 54 groups are on the latter list. As a side note, we know on the public safety website how many are listed on this list. We don't want to do the same thing for the no-fly list. That's a debate that has passed this evening. It says that this is a “broader list than in some other democracies—notably Australia and United Kingdom. The majority of the listed groups are Islamist terrorist groups, but the list also includes [other groups]”. This is a process that my amendments would obviously keep in place. They add, in brackets, “typically when a person is prosecuted for their conduct in relation to that group”. Most of the time, when someone is committing a terrorist act, terrorism charges are not even brought because the heinous acts that they have already committed provide sufficient material in the courtroom for the prosecution to move ahead. Legal commentators have raised concerns about whether executive listing under paragraph (b) will satisfy Charter standards when relied upon in criminal trials to supply an essential element of a criminal offence. The argument is that paragraph (b) substitutes a closed executive listing process for the proof beyond a reasonable doubt on the basis of public evidence that an alleged group has as one of its purposes or activities facilitating or carrying out any terrorist activity. The fact that the Charter argument has not yet been decided by a court may reflect the relative lack of reliance on executive listing mechanisms in terrorism prosecutions in Canada. Only six of Canada’s 26 completed criminal cases to date involved entities listed by the government (that is, a paragraph (b) group). Canada’s single terrorism financing conviction involved a donation by the accused to the (listed) Tamil Tigers. The modest, 6-month sentence in this case may reflect the fact that the non-remorseful accused sent only $3000 to what he believed was a justified cause, but it also appears to qualify, if not question, the executive’s initial proscription decision. I think the discussion around the situation in India, notably, has shown us how there can be issues on both sides of these debates. That was from Ken Roach's paper “The 9/11 Effect: Comparative Counter-Terrorism”, from 2011. I appreciate that the committee has given me much indulgence. I felt the need to read some of that into the record again, knowing that as a political science major, two professors would probably not appreciate selective reading of a very long and complicated paper. I hope that committee members will take the time to read it. Hopefully, they've already had the time to read it. I believe the support for my amendments hinges on work that's been done in papers such as this. Again, I'll conclude by saying I'm always open to studying ways to ensure better public safety. As we've seen, notably in the debate around returning ISIS fighters, everyone agrees that we want anyone who would commit heinous acts to be behind bars, but at the end of the day, we have to acknowledge that we have due process and we have the Charter of Rights and Freedoms. If we want to maximize our success, there are complicated questions around this, and this is one of them. I just want to confirm with the officials.... I'm trying to understand this particular amendment. Does it include everyone under the new definition, or are there entities listed that aren't terrorist groups by this definition? It's a listed entity as defined in section 83.01, so it would include the entities on the Criminal Code terrorist listing. As some of the other proposed motions to amend have shown, the term “listed entity” appears in other sections within the Criminal Code and elsewhere. For example, under section 83.11 of the Criminal Code, certain entities, such as authorized foreign banks and credit unions, have to determine on a continuing basis whether they're in possession or control of property owned or controlled by or on behalf of a listed entity, and this helps to ensure that Canada is complying with its international obligations to freeze terrorist property. That facilitates that particular effort against terrorist financing. Yes, and I understand that. I guess you've answered my question in a roundabout way, so that this listing of terrorist groups may not in fact be as encompassing as what is currently in the language. “Terrorist group” is a defined term in the Criminal Code as well, and part of it is.... It means an entity that has as one of its purposes or activities facilitating or carrying out any terrorist activity, or any listed entity, and includes an association of such entities. The Chair: Because NDP-85 is defeated, NDP-86 is defeated. We are now on LIB-52. This amendment goes to a distinction between a decision not to delist an entity and a decision to do so in the positive sense, in other words to delist. Currently under Bill C-59, in all cases involving a delisting application, the Minister of Public Safety is required to make a recommendation to the Governor in Council on whether or not the applicant should remain a listed entity, with the Governor in Council then making the final decision. On a decision not to delist, since that entity has already been listed by the Governor in Council on the recommendation of the Minister of Public Safety, once the public safety minister confirms that the test for listing the entity continues to be met, it is proposed that the minister not be required to then seek further Governor in Council approval for the continued listing of that entity. In other words, the proposed amendment would amend Bill C-59 by allowing the Minister of Public Safety to be able to make a decision not to delist a listed entity, without having to make a recommendation to the GIC. While I appreciate how this amendment plays with the language, I'm not noticing a significant change in what the legislation already says, unless I'm missing something. I'll call upon the officials to confirm that the legislation as it currently is phrased would require the Minister of Public Safety to seek Governor in Council approval for a continued decision not to delist an entity, or the continuation or the perpetuation of an entity on the list. It's similar in logic to the extension of an authorization, in the sense that the Governor in Council has already looked at this once, and the requirements continue to be met; therefore, the minister should not have to go back to the Governor in Council to seek continuation. Is that a fair understanding? Mr. Motz, are you satisfied with that? This is, as you've said before, a fallback position. Given that the amendments to repeal the entities listing have been defeated, this amendment seeks to change the period of publication of the results of the review of listed entities. So rather than using the wording “without delay” the wording would be “within five years.” So it is prescribing a time. This comes from a recommendation out of the Canadian Bar Association. If I may just correct myself, instead of “within five years”, it's “without delay.” I apologize for that. I would like to ask our experts one or two questions. If an entity remains on the list, it remains there after the review, but if it is removed from the list, does the de-listing take effect at the moment of the decision or when it is published in the Canada Gazette? I don't have a firm answer on that, but the Governor in Council would have made the decision to delist. We'd have to get back to you on that, but the assumption is to meet as soon as possible after the Governor in Council decision and that decision would be made public. I would have to confirm that. Sorry. Are you satisfied with that, Mr. Picard? Give me two seconds, please. If it's agreeable to the committee, can we suspend this until the officials have a chance to confer? We could keep going but suspend this until either somebody else can confirm it or tomorrow morning. We still have a vote, though. Does this amendment have any impact on any other amendment coming? Everything affects everything; that's the problem. I know. That's my family story. In normal circumstances I'd suggest Mr. Motz's suggestion makes perfectly good sense. Unfortunately though, if we suspend and don't deal with.... What are we on? LIB-52...? Now I'm confused, but sorry, I can't move without suspending the whole clause. I'll rephrase my question, and maybe that will get me the answer I'm looking for. What is the legal power of a publication in the Canada Gazette? Is it just confirming what has been done in the past, as information in an official way? I'm not an expert on the Canada Gazette, but normally it's used for engagement purposes, so policies going forward to consult on, looking for advice from the public, stakeholders, and so on, on the government's decision. It is for information on the intention of the government, yes. I am going to answer Mr. Picard's question. The use of the Canada Gazette is already specified in Bill C-59. It is simply that the deadline preceding the conclusion of the review was five years, whereas now, there is no longer a deadline after the conclusion of the review. You are quite right. But the question is that, if we confirm that it is an information instrument, the deadline should cause no prejudice in cases when entities are removed from the list. The fact of it being immediate would only add more administrative work. In fact, if there were a number of reviews, it would have to be reviewed each time and republished each time. That administrative exercise is useless, given that, in actuality, the delay causes no prejudice to the entity removed from the list. So I am going to oppose this. It is more than an administrative matter, because this is how people who are likely to be doing business with an entity can find out that it has been removed from the list. It is no good putting that on paper in 10 years; we have to allow people involved with a group that is on the list in error to continue their involvement with that group. In that way, they can know that that they are not involved with a group whose name is on the list of terrorist entities. The amendment makes sense, to be honest with you. Could officials weigh in on whether or not the delay in publication for five years is necessary, or was it just a drafting error? The intent of the amendment sets out the general parameters for publication, but builds in flexibility for the publication schedule, having in mind the proposed staggered review of newly listed and already listed entities going forward. For example, the bill would allow for bulk notices to be provided in one notice, as a notice with respect to each review could be resource-intensive. Right now, the entire list is reviewed every two years, and notice is given as to the results of the review upon the review. Going forward, there would be a staggered review. There could be newly added entities at different times. We can't predict future operational pressures, the increased size of the list, or when the entities are listed, so there are various unknowns. The intent here is to provide a degree of flexibility with five years as the outer range, but it allows for a grouping together of the notices without necessarily having multiple individual notices. That's the idea behind it. Are you fine with that, Mr. Picard? This would simply add special advocate provisions to the appeal process for the terrorist entities listing. Mr. Chair, we've had a discussion around the table on special advocates. There is sufficient legal authority and sufficient practice within the Federal Court to appoint amicus curiae in such processes where required and appropriate. The Chair: NDP-91 to NDP-93 have been dealt with. There's a bit of a challenge here, again recognizing the nuance that is not often part of our profession but is required for dealing with this particular issue. Professor Roach was mentioning the situation of the International Relief Fund for the Afflicted and Needy seeking to challenge its listing but not being able to do so because its assets were frozen. Following that, he mentioned the uncertainty that surrounds any pro bono work that could be offered to a listed entity, given that it would be seen as collaborating with a group that would be identified as a terrorist group under paragraph (b) of the section of the Criminal Code we've been dealing with. This amendment seeks to allow the use of those assets in challenging a terrorist listing. Ultimately, as I've said several times and will continue to say, this type of due process is what sets us apart from the very ills we are trying to combat. Notwithstanding the conclusion that appeal process may reach, having proper representation in a legally sound manner is appropriate, and this is what this amendment seeks to do. Mr. Dubé has his wish. Section 83.09 of the Criminal Code already talks about exemptions to freezes and says that it does not prevent people from hiring a lawyer. So, in my opinion, the amendment is not necessary. The Chair: We are on NDP-95. Yes, I'll put them in after you put yours in. Okay, great. I don't mean to attempt to do your job for you. As we've heard from a number of witnesses who came before the committee on this bill, and as we heard throughout the debate on Bill C-51 in the previous Parliament, the counselling terrorism offences are superfluous because, as we know, the counselling offence is already in the Criminal Code. Since we've been very keen to avoid perceived redundancies throughout this process, I'm hoping to see support for this particular amendment and to simply eliminate those redundant parts of the counselling terrorism offences that were introduced and are still here in Bill C-59. As this would have consequences for a number of Ms. May's amendments, I'm going to allow Ms. May to speak on these, please. As Matthew was just saying, there is no need to fix the language that was so problematic in Bill C-51, on advocating terrorism offences or advocating terrorism in general, or all of that. In Bill C-59, we're attempting to fix language for a section that is completely unnecessary and is, in fact, redundant to what we already have in the Criminal Code. As you noted, Mr. Chair, a number of my amendments go to this point, but again, it was the Canadian Bar Association, the Canadian Civil Liberties Association, and the International Civil Liberties Monitoring Group, among others, who asked why we want to insert a redundant provision in Bill C-59 to something that's already covered in the Criminal Code. Before I invite debate, I'm going to note for members that if NDP-95 is defeated, it will affect NDP-96, NDP-99, NDP-100, and NDP-107, as well as PV-41, PV-42, PV-43, PV-44, and PV-45. With that, we'll have debate. We, being the Liberal Party this time, are not supporting the amendment. However, in its place I do have proposed wording that would align—and the official can perhaps weigh in on this when we have it—the wording of Bill C-59 with the Criminal Code. With those amendments, just so you're aware, Chair, I do have amendments that are consequential to this one for NDP-96, because they both tie together. The only other Liberal amendment I see is LIB-54. You have to defeat it first of all. You have to adopt it or defeat it, and then we go from there. I misunderstood what was being proposed. We're just asking for some clarification here. We're going to deal with the debate on NDP-95, and then we're going to go to the vote on NDP-95. Ms. Damoff's argument is that the Liberal Party is going to move something to speak to the concerns raised by NDP-95. Is that understood, Mr. Motz? Maybe I got ahead of myself a little. Yes, a bit, but that's all right. It's actually good for the context of the debate. I think we're still on debate with respect to NDP-95. If I understand this correctly, Bill C-59 is proposing to remove the counselling of terrorism as an offence. Is that right? I need to get this thing back up again. While Mr. Motz is getting technological assistance from someone much younger than he is, I'm going to propose that once we've dealt with clause 143, we have a bit of a health break. An hon. member: No, keep going. The Chair: Is nobody interested in a health break of any kind whatsoever? The Chair: Aren't we keen? Okay, I'm happy to sit here. Are our officials fine as well? Okay. Mr. Motz, are you back on? Currently, section 83.221 of the Criminal Code speaks to the promotion of terrorism as opposed to the counsel of terrorism. We're back to that legal debate we had during testimony. What's the difference between the promotion of terrorism and the counselling of terrorism? I'm wondering whether it creates a duplicate law by having it changed. We heard in testimony that it removes protections for victims of hate crimes or violence, and the only judicial decision on this, in R. v. Driver, determined that the language existing today made no change to the burden of evidence. I'm curious to know why we're replacing “promotion” with “ counselling”. It makes no sense to me. I think it actually weakens the intent of this bill. This is exactly the sort of offence that part of Bill C-59 was going to improve, and in my humble opinion, I believe the change of this language actually weakens it. I'm curious to hear from the Department of Justice official and his backup whether you think this actually improves it. I don't want an opinion, but please explain to me why “counselling” is better language than “promotion”. Thank you. Quite a bit can be said. The Anti-terrorism Act, 2015, did create a new offence of advocating or promoting terrorism offences and the commission of terrorism offences in general. This was to respond to a gap or uncertainty in the law. The pre-existing counselling provisions in the Criminal Code would not apply where what is being counselled was not a specific terrorism offence but any, some, or all of the full range of terrorism offences found in the Criminal Code. In Bill C-51, the offence of advocating or promoting the commission of terrorism offences in general was criticized for using vague, overbroad, and potentially violating the charter because of its use of the phrase “advocates or promotes the commission of terrorism offences in general”. The government did a green paper consultation and has come back with a proposed reformed section 83.221 with the same intent but with wording to apply a well-known concept of counselling. Essentially it is the same thing. Counselling is the deliberate encouragement or active inducement of the commission of a criminal offence. Essentially advocating and promoting is the same thing, but counselling is clear to understand. There were briefs and testimony before the committee trying to get clear on how the proposed revised section 83.221 would interact with the current offences of counselling in sections 22 and 464 of the Criminal Code. Some believed that the offence is superfluous and duplicates sections 22 or 464. There was some confusion as to the purpose of the proposed provision. The overlap was intended to give the prosecutor increased flexibility in deciding which offence to charge on a given case, having regard to the particular circumstances of the case. Every person who counsels another person to commit a terrorism offence—other than an offence under this section—is guilty of an indictable offence and is liable to imprisonment for a term of not more than five years. (b) the person counsels the commission of a specific terrorism offence. Further to the discussions in the committee, and on further thought, the view that the overlap was intended to give the prosecutor increased flexibility was the initial design of the proposed offence or revision of the offence, but we've noticed that section 464 of the Criminal Code provides that, except where otherwise expressly provided by law, where one person counsels another to commit an indictable offence that is not committed, that person is liable to the same penalty as one who attempted to commit the offence, which is generally half the maximum penalty for the completed offence. In the case of life imprisonment, it would be 14 years, for example. It would be potentially open to interpretation that, due to the exception in section 464, which is a counselling offence that is not committed, the proposed section 83.221 would cap any counselling related to terrorism offences that are not committed at a maximum penalty of five years' imprisonment. This is a legal problem that could significantly limit the punishment available, but could be rectified by amending the bill. Are you aware of any court that has ruled that the promotion of terrorism has been ruled to be unconstitutional or against the charter? Okay. If it's no, would prosecutors then not treat it currently as the law? The current section 83.221 is the law, but the proposal is to eliminate the “commission of terrorism offences in general”, which was regarded by some as being unclear. With regard to advocating or promoting the commission of terrorism offences, it was thought that could be clarified by using the term “counselling”. Sorry, I don't want to get too far ahead. That's my point. We're dealing with amendment NDP-95. There might be something coming before the committee, just possibly, and I think what you're speaking to is what might possibly be coming before the committee. It'll just save time later. I would prefer to stay with procedural order. Are there any other questions or debate with respect to amendment NDP-95? I'm sorry, I may be the only one here who feels as strongly as I do about the difference between promotion and counselling. I don't think they're the same. I feel that it is lighter. We heard testimony from officials who came to committee, experts who said these changes were not helpful to what the whole purpose was behind Bill C-59, and that they actually weakened the current legislation and the Criminal Code. Again, I don't want to belabour the point, because I do want to complete.... This is for the record: I think we can get through all of this tonight. That's what I'm saying, but this is something that I think is critically important for us to deal with. Sir, could you introduce yourself and then respond to Mr. Motz, please? I'm Glenn Gilmour, legal counsel with the criminal law policy section of the Department of Justice. I work with Mr. Breithaupt. The terms “promotion” and “advocating” are terms that have been judicially interpreted by the Supreme Court of Canada. Promoting was examined by the Supreme Court of Canada in the well-known case of R. v. Keegstra. Advocacy was looked at by the Supreme Court of Canada in the case of Sharpe, which I think dealt with obscenity. In both of those, the Supreme Court interpreted those particular terms to mean active encouragement. Active encouragement is also the actus reusof counselling. We don't see any difference between promoting and advocacy and counselling, but counselling is well known. There are very few cases involving the wilful promotion of hatred offences, for example, compared with the number for counselling offences in the Criminal Code. It was felt that to be clearer in law and to avoid the confusion and avoid the possible misinterpretation that advocacy or promotion is broader than what counselling is meant to be, we moved to the well-known concept of counselling in criminal law in Bill C-59. Excuse me, Mr. Motz. Mr. Picard has a point of order. I would invite my colleague to keep his questioning relevant to the part that is coming to us shortly, since the amendment under discussion is about whether or not we have to repeal what is in the act. Can we proceed with the exact amendment under study and then keep on going on this subject? It's actually not a point of order, but it's not a bad suggestion. Mr. Spengemann, do you want to be on for this? Mr. Chair, I will defer to my colleagues, in light of your rationale, to be subsequent to whatever is coming our way shortly. I feel as if my amendment has gotten lost in relitigating the difference between C-51 and C-59. I just wanted to state, now that we've come back around, that the amendment I'm proposing that's before us right now is that I believe “promotion” is awful. I believe that the solution proposed by the Liberals of “counselling” is redundant, so I call for it to be repealed. Indeed, Mr. Dubé is right. It did get kind of lost. With that call to arms by Mr. Dubé, is there any further debate? We are not suspended, but we do have a complication. In order to vote on NDP-95, I had read a list, because I wanted everyone to know what consequential amendments would happen. The list included NDP-96, so that would eliminate NDP-96. If we defeat NDP-96, then the Liberals cannot move their amendment, which we now have in our possession, which would be quite awkward. However, if I remove NDP-96 from the list, then NDP-96 is still to be debated and so NDP-96 would, therefore, take precedence over the Liberal amendment because they are identical. In the interest of trying to get one of my amendments passed, I'm a bit in a jam, so I'm going to state for the record that, because obviously out of principle for this issue that I think is very important for the bill, my preference would be to have a vote on my amendment. If you're telling me the wording is identical to NDP-96, which I believe is what you're telling me, then I can withdraw my suite, stating on the record that I'll consider them de facto rejected, apart from NDP-96, because we're not going to see any of the other ones. If we were going to see some of the other ones, they would have also been presented with this one that's identical to NDP-96, so I'm just going to restate that I believe the counselling offence is already built into the elements of the Criminal Code that talk about the counselling of an offence, so while this is definitely a minor improvement over what was in Conservative Bill C-51, it certainly doesn't go far enough. In the interests of getting something out of that suite of amendments, I'll withdraw them and let the Liberals propose theirs. You are withdrawing NDP-95, NDP-96, and NDP-99? Yes, and also NDP-100 and NDP-107—those five. It's the whole lot. Okay. If you withdraw those, PV-41 and PV-42 would still be alive. For NDP-96, the Liberals would have to support it, because they can't move their own amendment if we've dealt with NDP-96. I haven't seen the wording so it causes problems, obviously. I thought it was distributed. I'm sorry. I thought it was. Why don't we suspend for five minutes and try to sort this out? Ladies and gentlemen, we are ready to resume. I'm going to call the vote on amendment NDP-95 with all of the consequential amendments that I previously read out, but with amendment NDP-96 withdrawn, if that's agreeable to Mr. Dubé. Let me see if I understand this. We will vote on amendment NDP-95 with all the consequential amendments, except for NDP-96. Then, assuming a certain result, you will move your first motion with respect to clause 143, page 150, not numbered. Then we will deal with clause 143 as amended and we'll move to clause 144. Mr. Dubé's NDP-96 takes precedence over Liberal this or that, on the theory of first up, best dressed. In this case, Mr. Dubé is first up and therefore best dressed. Given the way in which we are going to go about this voting, is everybody clear? Okay, I call the vote on amendment NDP-95 with NDP-96 removed from the consequential amendments. The Chair: Amendment NDP-95 is defeated. The consequence, as previously stated, means PV-41 is defeated as well. Therefore, it is in order for Liberals to move what is before members and is unnumbered, say LIB-A. Mr. Chair, before I introduce it, I wish people could see how well committees can work together. This is an example of it. I'm not trying to drag this out, but in particular to Mr. Dubé and Ms. May, who are the only members of their parties here and are handling every single clause, I want to thank you and applaud your being able to stay on top of it, because it's not easy for either of you. Given all the procedural things we are doing, what we're trying to do is align Bill C-59 with the Criminal Code. My understanding from the officials is that the wording we have distributed will do that. Maybe justice officials could weigh in very briefly, because it is getting late, on whether this will solve the issue of aligning this offence with the Criminal Code. I'm going to give a fair bit of latitude because this is a new amendment, so if members wish to discuss it, I'm perfectly open to that. First of all, the motion is moved. It is in order. Seeing no debate, who wants to respond to Ms. Damoff? As mentioned, problems arose in proposed paragraph 83.221(2)(b) from the wording “whether or not”. That is whether or not “(b) the person counsels the commission of a specific terrorism offence” and whether or not “(a) a terrorism offence is committed”. That led to a conflict with section 464 of the Criminal Code, which is counselling an offence that is not committed. The proposed change would remove the duplication and overlap. To explain the interplay among the counselling offenses, should this motion be accepted, section 22 of the Criminal Code would apply in respect of counselling someone to commit a specific terrorism offence, including a section 83.221 offence that is committed. Section 464 would apply in respect of counselling someone to commit a specific terrorism offence, including a section 83.221 offence that is not committed. Section 83.221 would apply where a person counsels another person to commit a terrorism offence without identifying a specific terrorism offence, and such an offence may be committed whether or not a terrorism offence is committed by the person who is counselled. Thank you, Chair. It's pretty tough on the fly like this. I don't know if it addresses the concern that we had, since our goal is to simply delete the clause entirely. Without having the proper study, I'm going to unfortunately—which is not my preference to do and don't normally—abstain on this. I will, however, just before you move to the vote, thank Ms. Damoff for her kind words about the work that has to happen when one is alone on committee. This goes back to some of the concerns I expressed earlier on the whole clause 143 issue. I appreciate that we wanted to tighten up the language from your perspective. I'm not settled that I understand the explanation as fully as I might need to so that I can vote, so I can make an informed decision. Quite honestly, I think the explanation you gave even confused you. I'm still struggling. I respect Mr. Dubé's point, but this to me is weakening this as opposed to strengthening it, which is what I would advocate for. I would certainly have a Department of Justice official weigh in on that. I know this is a last-minute amendment, and I haven't had a chance.... I may be completely out to lunch on how I think, but initially, that's my first reaction to the amendment on the fly. Mr. Gilmour, do you want to respond to that? I'll just say that, with the proposed amendment, what we're trying to do is deal with the problem of the potential overlap that had been mentioned in order to ensure that an appropriate punishment can be put on someone who counsels the commission of a specific terrorism offence, whether or not the offence is committed, and they would be captured by section 22 and section 464 of the Criminal Code, so that the maximum five-year penalty would not come into play for that, which was originally in Bill C-59. The current wording now is restricted to a particular kind of counselling of a specific terrorism offence where the specific terrorist offence cannot be identified, and that's getting to a particular kind of counselling where words are used that don't necessarily focus on.... They're not as specific as focusing on a specific terrorism offence in the Criminal Code, of which there are several, such as participating in the activity of a terrorist group, knowingly facilitating a terrorist activity, the terrorist financing offence, for example, or instructing someone to carry out a terrorist activity, but nonetheless, in all the circumstances, it's apparent that the person intended that one or more of those terrorism offences be committed. The way you spoke leads me to believe that you were aware of this language before tonight in this most recent amendment. I guess that begs the question of how long ago you were aware that this language had been changed, if it's dropped on us right now. That's the question I have. That's all I'm getting at. It's just the timing; that's all. I understand and even sympathize, but I don't think your question is relevant. Mr. Chair, I'll be a good sport. Given the situation—the last-minute changes to the NDP and Liberal amendments—there is confusion. It's 9 p.m., and I propose that we adjourn the study of the amendments so that we can analyze the situation on our side. In any case, there is little left to study. I think we could finish this study tomorrow in two hours at the most. I would like to tell committee members that I want it to be finished tomorrow and not to worry. Tonight, we should adjourn to give us time, out of respect, to verify exactly what it is. For our part, we will be presenting aspects that the committee will have to look at, and that will take some time. Yes, please. I move that the meeting be adjourned and that we resume at 10 a.m. tomorrow. It's a dilatory motion, so there is actually no debate. You heard what Mr. Paul-Hus wants to do, which is adjourn the meeting to tomorrow, if I have that correct. Those in favour of Mr. Paul-Hus' motion? The Chair: We go back to the debate itself. I had wanted to come in with this question earlier, and maybe this is the right time to add some clarity. At the risk of not overly indulging in debate that has taken place previously and with witnesses, I wanted to ask the Department of Justice officials about the legal difference in the jurisprudence between the dissemination of propaganda and the act of counselling. If you look at it from a communications perspective—and maybe this is the sense that Mr. Motz had, and maybe clarification would be helpful to everybody here—it seems there's a sense that the dissemination of propaganda is a one-directional mode of communication such that you can stand in a town square and you can disseminate propaganda, whereas the act of counselling requires that somebody at the opposite end who is receiving information actually gives feedback to the person that's doing the counselling. That's actually a more narrow interpretation of getting somebody to engage in an act, be it terrorism or some other kind of hate crime or criminal act. Is that a correct interpretation of the jurisprudence, or are the two things really much more closely connected than that interpretation would suggest? For counselling you're trying to counsel someone to commit an offence. The idea is that there would be a person who you're trying to effect, but it doesn't have to have an effect on that person. For example, if I were to counsel you to commit an offence and you're an undercover police officer and there's no risk at all of the offence being committed, I would still be guilty of counselling the commission of the crime. I don't know whether that answers your question. It does partly in the sense that.... If you disseminate terrorist propaganda, do you have to know roughly or even specifically who your audience is? In the act of counselling, you do have somebody who is your counterpart and who receives instructions, information, guidance, or suggestions. My understanding is that you don't have to know specifically who it is you're contacting. You don't have to know the identity of the person who you're contacting. You can counsel generally to a group of people. One particular example in that regard might be.... You may recall the decision in the Mugesera case in which Mr. Mugesera had made statements to a large crowd, referring to Tutsis as cockroaches, for example. There was a court case to have him deported from Canada to face trial in Rwanda, although I may have some of those facts incorrect. Essentially the Supreme Court of Canada held that in the circumstances, that could be considered counselling to commit murder, even though his speech was to a large group of people. I think that was extremely helpful, and maybe that's helping to narrow the gap in understanding that exists among us. I have Ms. Damoff and then Mr. Motz. Along with Mr. Spengemann's comment, to give an example, right now what we've seen across the world is propaganda, videos that encourage lone-wolf attacks. In your legal opinions, would the changing of this language weaken our ability to deal with those who propagate those sorts of lone-wolf attacks? We know we can go after the person who commits the attacks, but can we go after those who propagate it? I'm somewhat reluctant to give a legal opinion on that type of issue. I appreciate that. All I'm getting at is this. Does the language that's being proposed, and what we're talking about here, strengthen our ability or does it weaken our ability to go after those who have propagated or put out those sorts of videos? I would answer that simply by saying I think what has been proposed would help strengthen the ability and not weaken it. It would strengthen counselling, let's put it that way. It would strengthen the ability to use counselling. Is there any more debate? We will vote on LIB-A. Mr. Chair, what happened to Green Party-41? Green Party-41 went with the vote on NDP-95. You didn't call it at the time, but that's all right. Yes, I did. I read it all through. You did...? I'm sorry. It's late. I did not hear it get voted on. Thank you. The Chair: Don't withdraw it now. It is therefore moved. Is there any debate on NDP-96? Just to clarify, this is exactly the same as the amendment I was going to propose. We're happy to support it, Matthew. Let's not stretch this point too far. Is there any further debate on NDP-96? The Chair: That bumps PV-42. The Chair: We are now on to clause 146, and we have CPC-26. What this amendment is proposing is that we delete lines 31 to 36 on page 130, which deals with the recognizance specifically. It deletes the changes to the Criminal Code for these recognizance orders under this legislation and reverts back to the threshold for seeking a recog order that “is likely”. That's what I'm proposing, that this goes back to the old language that it's “likely to prevent”, as opposed to the new language which is “necessary to prevent”. In my opinion, this change raises the bar on getting a recog order to make them harder to obtain. That's why we want to be able to do that. I'll draw back on my experience, not specific to terrorist issues, but on having recog orders, and they can be a valuable tool. Quite frankly, as we heard from our experts who testified before the committee, recog orders are the most usual tool now that our national security enforcement agencies use to try to keep tabs on an individual who poses a national security risk. We already know that the threshold to obtain those might be somewhat challenging. The threshold right now is “likely”. If we're changing it in Bill C-59 to “is necessary to”, that is upping the threshold, which makes it even more difficult for these orders to be obtained. If we're really trying to put some sort of monitoring mechanism in place for those who are a national security risk, then I don't understand for a moment why we would suggest that we want to raise the bar to that level. In my opinion, recog orders are about as useful as the piece of paper they're written on. Unless you do constant monitoring, it's a piece of paper. You're asking someone to follow the rules. If they don't want to follow the rules—they may or they may not—at least you then have a recourse if they breach those conditions. If you're making it harder for law enforcement and national security agencies to even obtain that recog order in the first place, then it's even more useless than we have right now. That's the reason we are concerned about the replacement of “is necessary” from “is likely”. After debate, I'd certainly appreciate any comments that our officials may have on the implications of that sort of language on the ability to even obtain a recog order in the first place, and whether that threshold is increased to the extent that it is going to continue to maybe put a risk to public safety and national security because we just don't have that threshold met on an individual. If they did do something, we don't have a mechanism in place where we can even hold them accountable before the courts. I'm assuming by “recog”, you mean “recognizance”. Sorry, it took too long to say. Mr. Glen Motz: Yes, sorry. The Chair: Were you directing that to...? I think the legal experts may have to respond to the difference in threshold from “is necessary” to the old “is likely”. Mr. Davies is shaking his head, but he's shaking his head because the lawyers are the ones who should respond. Can Mr. Gilmour and Mr. Breithaupt respond in a pithy sort of way? This refers to a recognizance with conditions, so it's a specific recognizance order. The threshold of reasonable suspicion is the imposition of recognizance on a person, or the arrest of the person as necessary. It existed in the past from 2001 to 2007 and 2013 to 2015. While this is a higher threshold than the one that currently exists, and is the one that this motion would propose should continue to exist, the “necessity to prevent” threshold could be met, for example, if it appears imminent that a terrorist activity may be carried out. It does require the police to present evidence of a greater link between the conditions or arrest and the prevention of terrorist activity. The threshold is actually higher now to be able to even obtain it, and the law enforcement agency, the national security agency, would have to show that much more evidence that it is necessary to prevent a terrorist activity, as opposed to “it is likely to prevent”. It raises the bar a bit, yes. It responds in part to the feedback received during the national security consultation that the thresholds were thought to be too low. Are you confirming that even in an age when we're trying to improve our ability to respond to national security threats and risk, this language makes it even more difficult, and the threshold is that much higher? Why would it be necessary to repeal this, or change that particular section when to me it flies...That may not be for you to answer, that's an opinion. I leave that to my colleagues over there who, I hope, at least will vote for one of my amendments. Is there any further debate? We're doing a recorded vote. The Chair: Now on NDP-97 we have Mr. Dubé. (b) the peace officer suspects on reasonable grounds that the detention of the person in custody is necessary to prevent a terrorist activity. I would suggest, and I certainly would defer to the legal experts in the room, that the provision that you're asking for here exists already in law, that when people are detained, they are given their rights. That exists now, and I don't see the need for this to exist, to be honest with you. Can the officials confirm that? Yes. The recognizance with conditions regime does not need to provide explicitly for rules regarding the right to counsel, as these proceedings are governed by section 7 of the charter. Mr. Chair, under this amendment, section 83.3 will cease to have effect on July 15, 2018. This is called a sunset provision. It deals with the part of the Criminal Code that allows individuals to be detained on remand for up to seven days without being subject to criminal prosecution. Obviously, we consider this situation nebulous, which is why I am proposing this amendment. Unless I'm mistaken, with amendments that have been defeated, you can go from clause 148 to clause 157 in a group. I think you might be right. We will just make sure that none of the Green Party amendments would be inadvertently lost here. May I group clauses 149 to 157 for voting? The Chair: We are now on amendment LIB-53. The purpose of this amendment is to have section 83.3 come into force after Bill C-59 receives royal assent. I won't read the entire amendment because it is explicit. The Chair: Next is amendment CPC-27. Mr. Chair, amendment CPC-27 proposes a bill in the bill, just as the Liberals proposed a bill on torture. I will now briefly outline Bill C-371, which was created by my colleague Tony Clement, in 2017. This bill gives the government the ability to establish a list of foreign states, individuals and entities that impede freedom of religion, impose punishments based on religious beliefs, or carry out or support activities that encourage radicalization. It deals with what is called the “secret ways” through which money is poured into organizations and institutions in Canada that support radicalization. It would prevent an individual, entity or foreign state that supports or encourages radicalization or is associated with it to fund an institution through donations or gifts. Individuals and institutions in Canada would be prohibited from accepting money or gifts from states, individuals or entities on the list. Three amendments to the Income Tax Act are included to recognize the provisions of the bill. It should be noted that in 2015, the Standing Senate Committee on National Security and Defence completed a study entitled “Countering the Terrorist Threat in Canada”. In its recommendations, the Senate report urges the government to take steps to prevent the entry of foreign funds into Canada in cases where funds, donors or recipients are associated with a radicalization movement. Currently, the Income Tax Act allows the removal of charitable status from groups affiliated with terrorism. In addition, the government maintains a list of designated terrorist groups, including Al Qaeda, ISIS and Hezbollah. This bill would improve the government's ability to control incoming funds beyond charities and designated terrorist groups. By developing and maintaining a list of foreign states, individuals and entities that promote radicalization and that facilitate the funding of groups that promote or participate in radicalization, the government would have a better set of control measures. We have known for a long time that there are gaps that allow money to come into Canada to support radicalization. The legislation includes provisions on flexibility and review and allows the groups on the list to appeal. This flexibility allows the government to act quickly when sources of funding are identified, but also to be fair when a group or individual has adequately demonstrated that they should no longer be on the list. In fact, in my previous job, I actually raised with representatives from some of the countries who might be involved in this and suggested to them this was not helpful. The difficulty in most cases is that the monies are not coming from governments. They're coming from fairly wealthy institutions or individuals within some of these countries. It makes it doubly difficult to track. It doesn't mean you're not right in raising it. I just don't have an easy solution. The money comes in different ways, in secret ways. Money comes through institutions. There are two organizations in Canada. Basically they are U.S. organizations that are operating in Canada. One is called AIMaghrib Institute, the other is called AIKauthar Institute. Both work in universities, not in mosques. Both give lectures. Both organize seminars. They are the ones who brainwash these young kids in lectures. I can tell you that my own organization was offered $3 million. We refused, even though I had not a penny in my account at that time, when I started the organization, because this is a Canadian organization, and we don't need funding from anywhere else. The same thing with our mosques in Manitoba. We were offered money from Libya when we made our first mosque. We refused it. Are there some mosques that have accepted money from overseas because it was legal to do so? If we want to curtail them, we have to make it illegal, not just for Muslims but also for all groups, for you to raise funds from abroad. That would be my response. That said, I think amendment CPC-27 is of paramount importance to Bill C-59. We have heard that there are finance-related elements that already exist in another act. Therefore, it seems that it is more or less effective. So I strongly recommend that the committee accept our bill in Bill C-59. Before I open up debate, members should know that if CP-27 is adopted, so too are CPC-28 and CPC-29. Similarly, if it is defeated, so too are CP-28 and CP-29. Mr. Chair, I would like a recorded vote, please. The Chair: Therefore, I declare CPC-27, CPC-28, and CPC-29 defeated. We are now on to clauses 159 through 167. Do I have permission to group them for the vote? The Chair: We are now on to NDP-108. I'm moving—and I can't believe it—my final amendment. This amendment follows on the suggestions of several witnesses we heard from, including Professor Wark, Professor Roach, and the International Civil Liberties Monitoring Group, which all suggested shortening the review period for the legislation, and that it should be commenced in the fourth year after the act has passed and completed by the fifth. Members should also know that if NDP-108 is adopted, PV-46 cannot be adopted. We've observed the custom of having Ms. May speak to her amendment at the same time. Do you wish to speak to your amendment, Ms. May? Yes. Thank you, Mr. Chair. It's not just custom. I hate to be a stickler, but there is that motion you passed that requires me to be here. I know, I personally passed it. The committee passed it, and we all know that it's just a random coincidence that the same language was passed by every committee, because a committee is the master of its own procedures. I am grateful for the many changes that are being made here today. I wish we could have made more, but remaining vigilant to make those changes, I'd like to see the review period set at four years instead of six. The Chair: Do you wish to make any other observations on PV-46? No, except to say thank you. I know it's not your personal fault that the motion was passed by the committee. Do take it to the higher-ups some day. Those in favour of PV-46...? The Chair: We're on amendment LIB-54. This amendment establishes that the proposed avoiding complicity in mistreatment by foreign entities act would come into force on a day to be fixed by the Governor in Council. This allows the government time to prepare to meet the requirements of the new act before it comes into force by, for instance, preparing the required direction. I'd say that in continuing to prove the problems with an amendment that's incomplete, I think the.... It will come into force as soon as the bill is adopted, so I will be voting against this amendment. The Chair: Shall the schedule carry? An hon. member: On division. Mr. Picard, you apparently are quite anxious to move it. Mr. Chair, to wrap up, I want to say that I am against this amendment because I believe the Liberal Party is trying to promote a foreign policy through a national security bill. It isn't appropriate to try to tell others what to do through Bill C-59. Mr. Chair, I'll be supporting the amendment. I want to take a moment to thank you for your leadership for getting us to this stage of the amendments and for doing such a great job on the process as a whole. The Chair: Shall the preamble carry as amended? Shall the chair report the bill as amended to the House and sing the “Hallelujah Chorus” simultaneously? Shall the chair offer to Mr. Dubé some wine? The Chair: It's the cheapest wine I could find. Can I just say for the record that it is The Legend of Big Bill. Before I call for the last vote, I do want to thank all of the officials who have gone through this entire process with us. Your contributions are noted and we thank you for them. I also want to thank Minister Goodale's staff who have been hovering in the background, and Minister Goodale himself. I think this is the way committee should function, to be honest and candid about it. This is important legislative work. You've all worked hard and contributed over many months. You are all to be commended. With that, I will call the last vote. Shall the committee order a reprint of the bill as amended for the use of the House at report stage? The Chair: Do you want a recorded vote on that too? I'm going to take the chair's prerogative and say that passed. I have a point of order, Mr. Chair. I got the idea from Pam because she was saying it. I think she's right that our staff as well deserves to be commended. They put up with us. They're the ones behind us. The meeting is adjourned until Tuesday.